These Crispy Bean and Cheese Tostados are quick and easy to make! 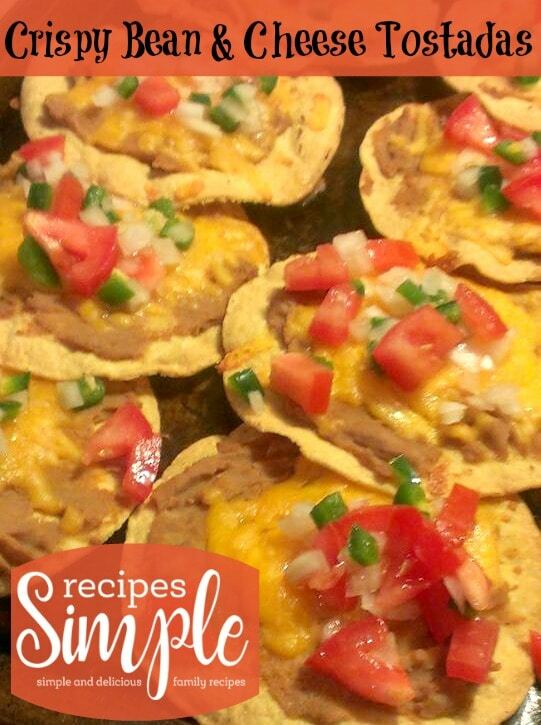 This recipe was submitted by Audrey M. who said this is one of their go to meals on busy days when they need something quick for lunch or dinner. It’s a great assemble-it-yourself kind of dish. You can also add meat, vegetables and other toppings. Spread corn tortillas out on foil lined cookie sheet and brush lightly with olive oil. Bake the tortillas for 4 to 5 minutes per side. They should be crispy and golden on each side. Transfer to a paper-towel lined wire rack to cool and harden. Combine refried beans, salsa and sour cream in a saucepan and cook over med-low heat until heated through, stirring occasionally. Top the tostadas with the beans and cheese and add your favorite toppings. Add toppings such as avocados, lettuce, tomatoes, sour cream, black olives, onions, jalapeños and guacamole.